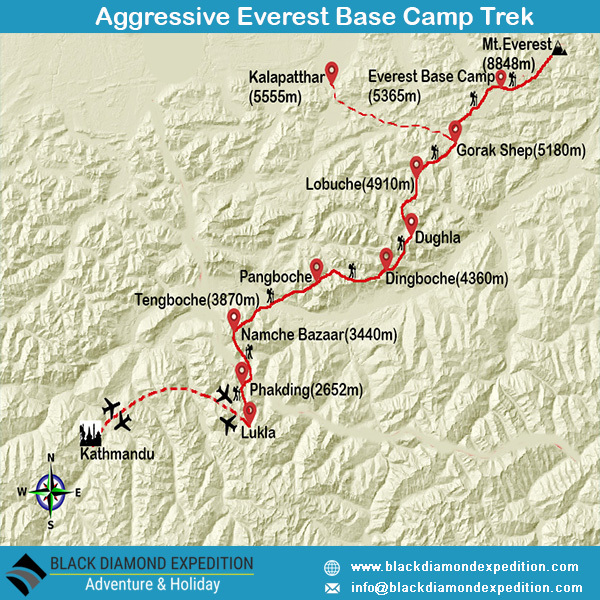 Aggressive Everest Base Camp Trek is a great introductory trek for those who are looking for the wonderful adventure to the base camp of the world’s highest mountain in a very short time as much as possible. This trek ensures you a proper acclimatization en-route and takes you to the height of base camp very smoothly even though this is a shorter trip compare with other Everest Base Camp trip. The memorable journey to Everest Base Camp start by taking a flight to Tenzing-Hillary Airport at Lukla and takes you towards the base camp passing through famous Sherpa Villages along with Pakhding and gateway to Mt. Everest- Namche. The trip furthers with a visit to the world’s highest Buddhist monastery the Tengboche, and the Everest Base Camp itself, where Sir Edmund Hillary and Tenzing Norgay set off on their epic journey to the successful summit of Everest in 1953. Upon arrival in the Kathmandu Airport (TIA), you will be welcomed and greeted by our representative and then transfer to the hotel. After check in, there will be a pre-trip discussion in Black Diamond office where we can meet our trek leader and other team members. Black Diamond briefs us regarding the trip as well as provides us opportunity to ask any questions we may have regarding our upcoming adventure. In the evening, we will organize a Welcome Dinner at an excellent traditional Nepalese restaurant where you will enjoy a Nepalese cultural program as well as a fine meal. Early morning after breakfast transfer to Kathmandu airport in domestic terminal to fly over Lukla, a gateway destination for trekking in Everest Region. After 40 minutes adventurous and scenic view flight we reach in the Tenzing Hillary Airport at Lukla. Here we meet our other crew members and then we begin our first day easy trek through forest, villages and along the Dudh Koshi River to Phakding. Today also we follow the Dudh Koshi River and cross suspension bridges many times, one of which is the famous Hillary Suspension Bridge. On the way we can see the beautiful view of Mt Thamserku (6618m). Passing through the small village of Benkar, Chumoa, Monjo we enter into the Sagarmatha National Park. We cross the last village of Jorsale before Namche and then gradual walk through the forest and bridges until we reach the confluence of Dudh Koshi and Bhote Koshi Rivers (Larja Dobhan). After then about 2 hours steep climb we reach at Chautara from where we get the first sight of Mt. Everest. From there another 1.5 hours easy walking bring us to Namche Bazzar, the gateway to Mt. Everest and the main trading center. After 2 days walking we take a rest in Namche Bazaar to acclimatize the body. It is recommended to stay active during the rest day also, which helps to acclimatize our body quickly. Walking little high altitude around 100 ft will help to acclimatize properly. Morning we do hike in Thame and later explore Namche Bazzar. Morning witness and capture the awesome view of mountains in the background of Tengboche Monastery. After breakfast we continue the journey through gradual down from rhododendron trees and come across the suspension bridge over Dudh Koshi River. About an hour further walk will bring us to Pangboche which offers a dramatic view of Himalayas and village. Passing by several Chortens, Mani walls and Pangboche Gompa we continue the trek through the village of Syomare, Orsho and Samso Ogma where we meet the junction. From there we follow the right path and after crossing the bridge over the confluence of Khumbu Khola and Imja River we climb steep path to Chyakunwa Kharka from where we can see the spectacular view of Taboche, Ama Dablam, Khangteka, Thamserku, Nuptse, Lhotse and many more. After few minutes gradual climb we will be welcomed by chorten and prayer flags in Dingboche. Today all the way is dry but offers awesome Mountain View on all sides. We start the trek walking gradually through the Khumnu Khola Valley and reach the yak herder’s place, Dusa (4503m). After then following the narrow trail, we reach Phulung Karpo where camp site was asserted during first successful Everest Expedition in 1953. Further the sight of Chola Lake and Mt. Pumo Ri (7161m) appears on the way. As we descend the trail, the view of Mt. Pumo Ri disappear and come across the roaring stream. We cross the small wooden bridge and climb steep up to Dughla. Dughla offers a marvelous view of Nuptse, Cholatse, Thamserku and several other magnificent peaks. Today is short but difficult walking day as we have to walk through the boulder path left by khumbu glacier. Initially we walk steep path through moraine of the Khumbu Glacier and climb to Thukla Pass (4830m). At the top there are piles of stones with prayer flags, memorials of death climbers including Babu Chiri Sherpa, 10 times Everest submitter and Scott Fischer, American mountaineer. As we descend to Khumbu Glacier moraine, several great peaks like Khumbutse, Lingtren, Pumori, Mahalangur Himal greet us. After crossing Khumbu Glacier we get the beautiful sight of towering Mt. Nuptse (7855m). Further climbing the steep trail along roaring stream we reach Lobuche. Today we have two options. First one is, we reach Gorak Shep and in late afternoon hike to Kalapatthar for impressive sunset view over Himalayas including Mt. Everest. Second one is, we reach Everest Base Camp and then trek back to Gorak Shep for overnight. We can split the group for option 1 and option 2. After early breakfast we start trek through the moraine of Khumbu glacier. Passing through Italian Research Center and Lobuche Pass (5110m) we reach to Chongri Glacier. On the way to Chongri Glacier we get the first sight of the summit of north ridge of Mt. Everest along with 360 degree view of snowcapped mountains including Mt. Pumori, Mahalangur, Lingtern, Khumbutse, Nuptse and many more. Walking up through boulder path of Changri glacier we reach Gorak Shep. Option 1:- Evening we hike to Kalapatthar. Kalapatthar is the popular view point hill. It takes 45 minutes to reach from Gorak Shep. From there we can see very impressive, massive and sky towering Himalayas including Kantenga, Pumo Ri, Thamserku, Changtse Ama Dablam, Kantenga, Nuptse, Lhotse, Everest and many more. Option 2:- Leaving the Kalapathar (view point) on left and passing by Indian army mountaineers' memorials we continue towards Everest Base Camp which takes us around 3 hours to reach. We celebrate the achievement of our trip goal by capturing massive Nuptse, Khumbuste and Punori from Everest Base Camp in our camera. But from here Mt. Everest is not visible. After spending memorable moment we trek back to Gorak Shep. Note: Sunset view from Kalapatthar is more impressive than the sunrise view over snow capped mountain including Mt. Everest. So who wish to hike Kalapatthar today, our guide and porters will accompany you. Those participants, who had choose option 1 yesterday (Kalapatthar), will visit Everest base camp today. And who had choose option 2 yesterday (Everest Base Camp); they will hike to Kalapatthar today for sunrise view over snowcapped mountains including Mt. Everest and then wait for other participants to return back in Gorak Shep. After having lunch together in Gorak Shep we trek back to Dughla via same route and then follow the right side trail to Pheriche. After breakfast we trek down through rhododendron and juniper forest passing by Samdrang village, stone wall, Tsuro Og and then Samso Ogma, Orsho and Syomare village. Crossing the river several times through suspension bridge and walking steadily we reach at the home of biggest Buddhist Monastery of Everest region, Tengboche. From there we descend down to the river and again crossing suspension bridge, passing by beautiful village of Sanasa, Kyangiuma as well as enjoying magnificent view of Himalayas on the way we reach at Tenzing Norgye Memorial Stupa. On the way we may encounter with wild life such as snow leopards, colorful pheasants, Himalayan Thak, deer etc. After then about one hour gradual walk will bring us to main town of Everest Region, the Namche Bazzar. Today is our last trekking day and we trek back the same route but we feel completely different view. Trail is steep, so we need to walk slowly supporting own body with shaky legs. We trek back exploring attractions on the way, experiencing Sherpa culture in beautiful villages and enjoying distance view of Himalayas. Freezing cold turns to moderately warm and our body get relief today. After breakfast we begins gradual walk for few minutes and then steep down to the Larja Bridge which is the confluence point of Dudh Koshi and Bhote Koshi River. From there the gradual walk along Dudh Koshi River will bring us to the exit point from National Park, the Jorsale village. Again following the Dudh Koshi River, pass by the small village of Monjo, Chumoa, Benkar and walking through rhododendron forest, we reach Phakding. Few hours more gradual walk will bring us at Lukla. In Lukla we do relax and stretch the tired body. Late afternoon we can stroll around the Lukla. Evening we enjoy the last dinner with crew members. NOTE: Kathmandu-Lukla-Kathmandu flight may get delay for few hours or may even cancel for few days due to frequently changeable and unfavorable weather condition of Himalayas. Such condition may arise even in the best season. So we kindly request you to keep some spare days in hand to cope with such condition. If flight is cancelled at the start of trip, either you do wait till you have spare days or do another adventure trip to other regions. If flight is cancelled after the trip, either you have to wait for following day’s flight or you have to take helicopter rescue to fly back Kathmandu. The helicopter charges around USD 5,000 and it can lift 4-5 people per flight. If everything goes as plan during trek, in your spare time you can enjoy sightseeing, jungle safari, rafting, bungee and many more luxurious and adventurous activities. 2 nights accommodation in Kathmandu with breakfast (Hotel Encounter Nepal- www.encounternepal.com or Hotel Norbu Linka- www.hotelnorbulinka.com) or similar 3-star hotel as per availability.